The Meshify C marks the debut of a new series of cases from Fractal designed to sit just below the iconic Define series in terms of price and features. 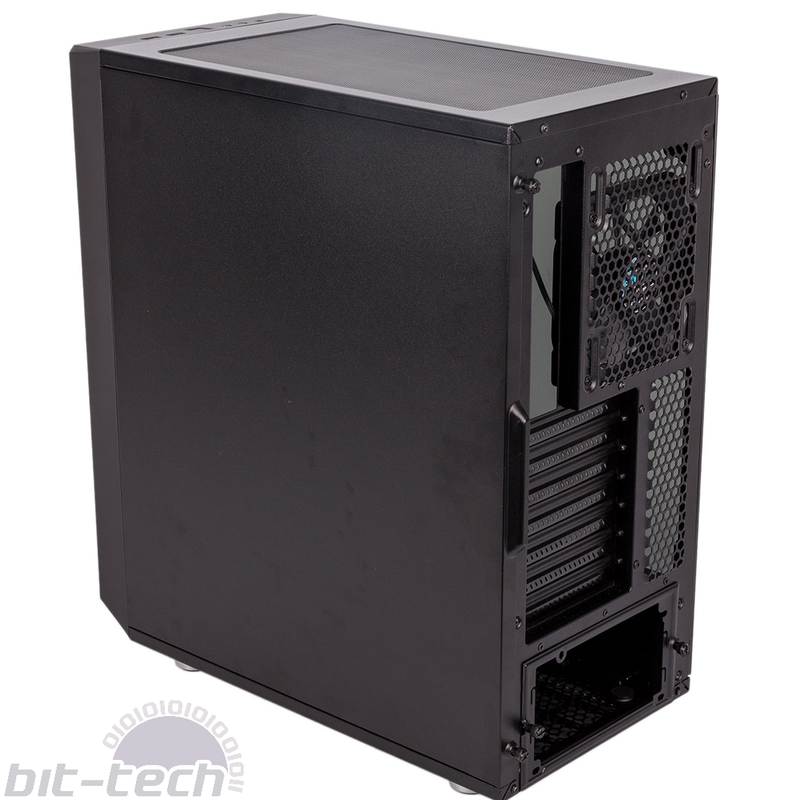 Fractal Design is well known for understated looks, so the Meshify C with its somewhat bolder and much more airflow-oriented design indicates the start of some diversification on Fractal’s part. 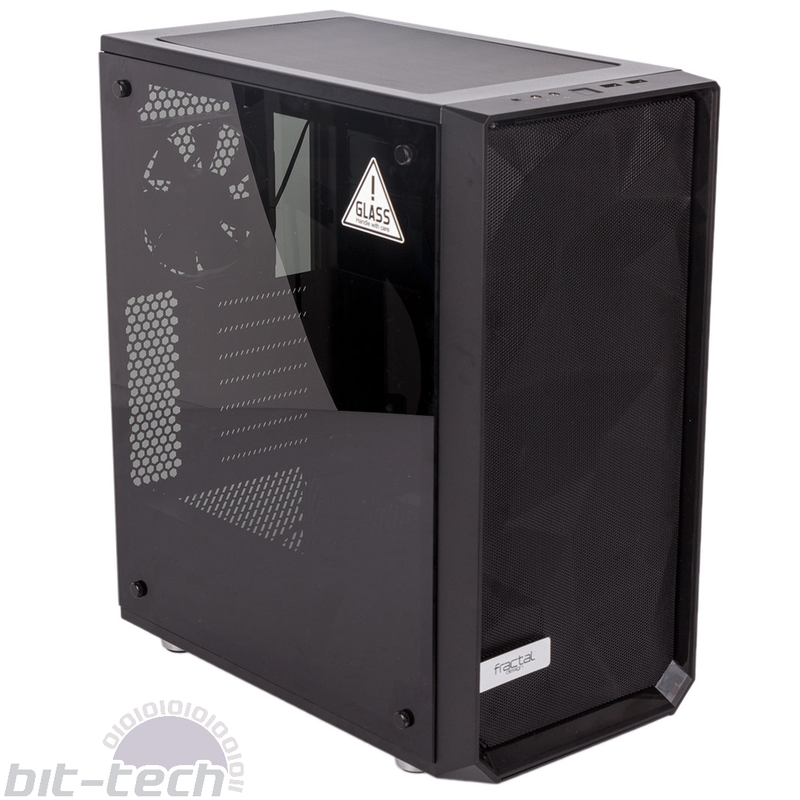 Like so many cases these days, the Meshify C has a tempered glass side panel. This certainly isn’t a complaint; we’re happy to see what was once considered a very premium material making its way into more and more mid-range cases. The glass is tinted, making it a good match for the all-black colour scheme (even the USB 3.0 ports are blacked out), but still gives you practically a full view of the interior. No RGB lighting is included with this case, but the neutral colour scheme makes it a good match for RGB-equipped hardware at least, and the tint on the window will keep things looking subdued rather than garish. Build quality is on the whole satisfactory. The opposite side panel is a simple but solid steel one, and though the roof is made of plastic it’s fastened securely with rivets. The case also stands on rubberised feet giving it lots of grip. The front, meanwhile, is dominated by an angular mesh construction that’s supposedly designed to encourage airflow through the single 120mm intake fan (a Fractal Design Dynamic X2 GP-12). There’s a glossy plastic trim around the mesh, and a foam filter is built in to prevent dust getting in. Complementing the intake fan is a rear 120mm exhaust fan (same model as the other) fitted on height-adjustable struts so you can align it with your cooler if you like. With the additional front, bottom, and roof fan mounts, it’s possible to install up to five extra fans as well. Given how porous the case is, it’s thankful that it’s been given full dust protection; a simple magnetic filter protects the roof, while a full-length filter that helpfully slides out to the front shields the entire bottom area, including the PSU intake section. Both of these are very easy to remove, clean, and replace. The front I/O panel is located on the roof – not a problem given that the case isn’t that tall. It’s your standard selection of dual USB 3.0 ports, audio jacks, and power and reset buttons. Drive bays 2 x 3.5"/2.5", 3 x 2.5"